A novel UofT collaboration is using SOSCIP’s advanced computing platforms to gather insight into how the long-term effects of climate change could impact wind and the built urban environment. 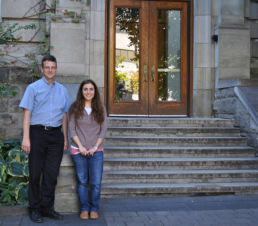 Prof. Oya Mercan with the Department of Civil Engineering and Prof. Paul Kushner with the Department of Physics, both at UofT, are combining their areas of expertise to help urban planners and engineers better plan and prepare for smarter cities. “Our research project is about how climate change will impact the built environment in 2050, such as how tall buildings in particular may be impacted by climate change,” said Prof. Kushner. Prof. Mercan approached Prof. Kushner with the idea. “Researchers talk a lot about how climate change will impact temperature, but much less about how climate change affects wind and other environmental influences on the built environment,” explained Prof. Kushner. Profs. Mercan and Kushner and their teams are collaborating with researchers at Environment and Climate Change Canada (ECCC) to access the full set of climate data and models. One of the major challenges with this type of research is that climate models generally provide large-scale data, while engineers typically work with small-scale data. To do this, the team is accessing the SOSCIP Blue Gene/Q (BGQ), one of Canada’s fastest supercomputers. The BGQ is designed to handle large-scale distributed applications that require massively parallel processing power, including that of climate change forecasting. “Having access to SOSCIP’s BGQ is important because we can’t do this type of simulation with individual computers. The calculation requires a large-scale block of individual buildings simulated with computational fluid dynamics so the wind structure and interactions are understood,” said Prof. Mercan. For the second phase of the project, the team will collaborate with industry partner NCK Engineering and apply their climate change forecasts to select buildings located in Toronto’s downtown core. The data will be used to evaluate the performance of existing buildings under the anticipated climate change conditions of 2050. The team will also attempt to make recommendations on acceptable wind loads for new and existing building designs. The research is important to supporting smart cities because it will enable urban planners and engineers to add components to current structures to help minimize and control wind vibration on tall, flexible structures like high rises. It can also provide valuable insight into future building projects that support sustainable cities. The impacts of climate change on wind have not been well explored, according to Prof. Mercan. “This type of research will build a new understanding of the impact of climate change on wind, and ultimately, on built environments like tall buildings. If we realize through the research that the loads will significantly increase, then we can start looking into this now and be prepared to rehabilitate a number of large structures before 2050,” said Prof. Mercan.